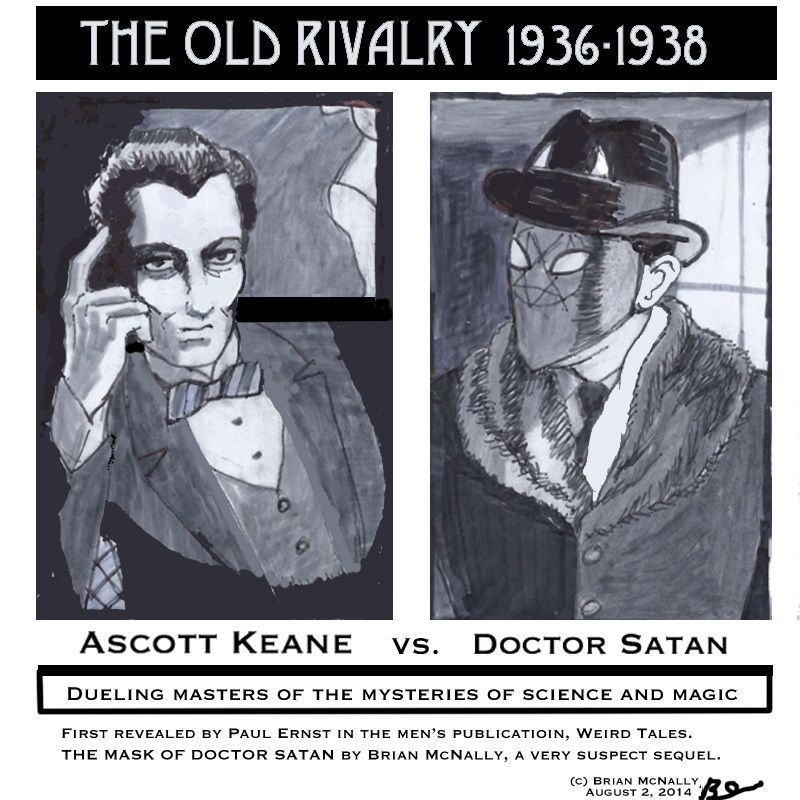 FINALLY: TALES OF WEIRD CRIME with Doctor Satan — FREE 30 pages of pulse pounding pulp story, part one. Welcome to the Golden Age. Part One of Three – 30 pages. See PDF for all details. Part Two is getting edited for polish. In 1938 Doctor Satan opens a supernatural gate and summons a horrible and deadly monster in the middle of a titanic hurricane. All over Gotham City, police officers are brutally slaughtered by a ghostly executioner from the other side, walking with young black men, now ghosts, that never had a chance to see justice done when they were alive. Over a hundred police could die in a fortnight, in a wave of supernatural blowback. The death of Jim Corrigan is key, as he is the first officer to fall. His death launches Doctor Satan’s deadly plot to use a wrathful spectre of vengeance to decimate the Gotham PD. A circle of anonymous vigilantes gathers to face the approaching storm, working in the shadows. 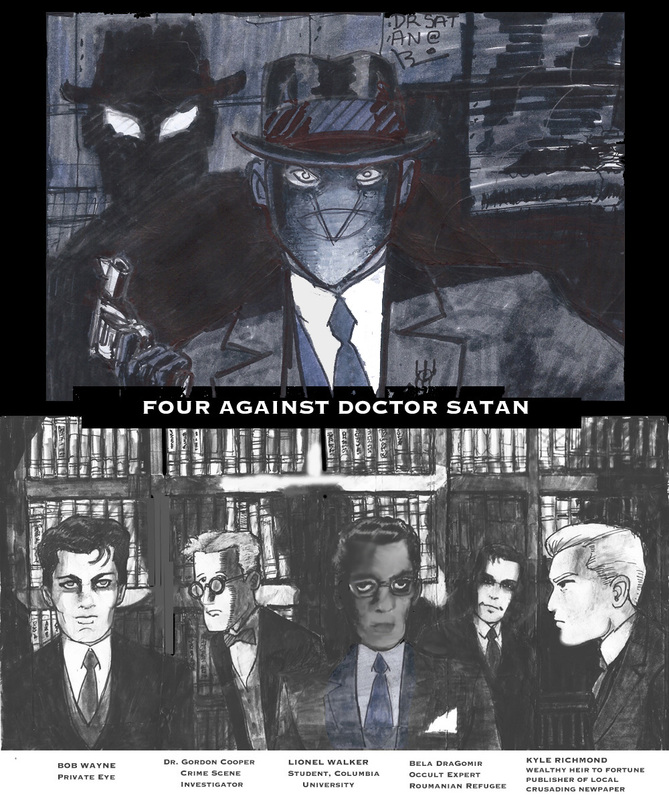 The mysterious Sandman runs the opposition to Doctor Satan and his insidious plot. Female adventurer the Black Fury and her partner, the Green Lantern join the group as new members. Carter Hall, international adventurer, brings the weapons as quartermaster, and Doctor Fate lends his strength as a sorcerer. And deep in the dark of the night, the Shadow laughs. Cover is a tribute to all the old cover artists of the Shadow by Maxwell Grant and others in pulp magazines of the 1930, which somehow works with the Japanese ad copy. I also surprised myself with all the Kaluta and Wrightston style touches. I first encountered their Shadow when I was eight (40 years ago). I loved their horror style on the Shadow, mixed with crime drama and pulp heroics. Five chapters have already been completed (26 pages so far). Three more chapters left – I have been telling the story in a series of 4-8 page installments. I created a new page to group the entire story in one place for easy viewing. Please see here. 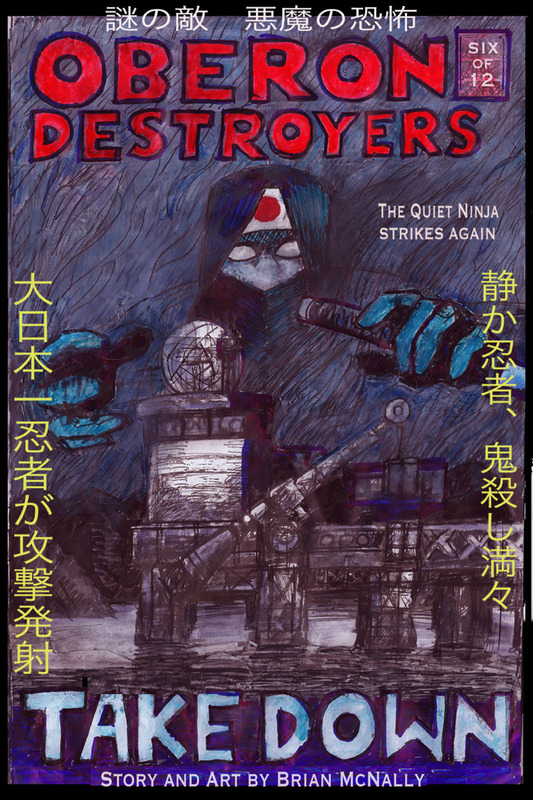 The Quiet Ninja is Japan’s Greatest Ninja and a key player in the secret Occult Wars. He is puritanical in his desire to destroy occult villains that seek to gain the upper hand against humans through sorcery and hocus pocus (see previous issues). His family has been on the frontline of this war for 2000 years. This issue is all action, and gets pretty bloody. Most of the story is silent action sequences with little or no dialogue. 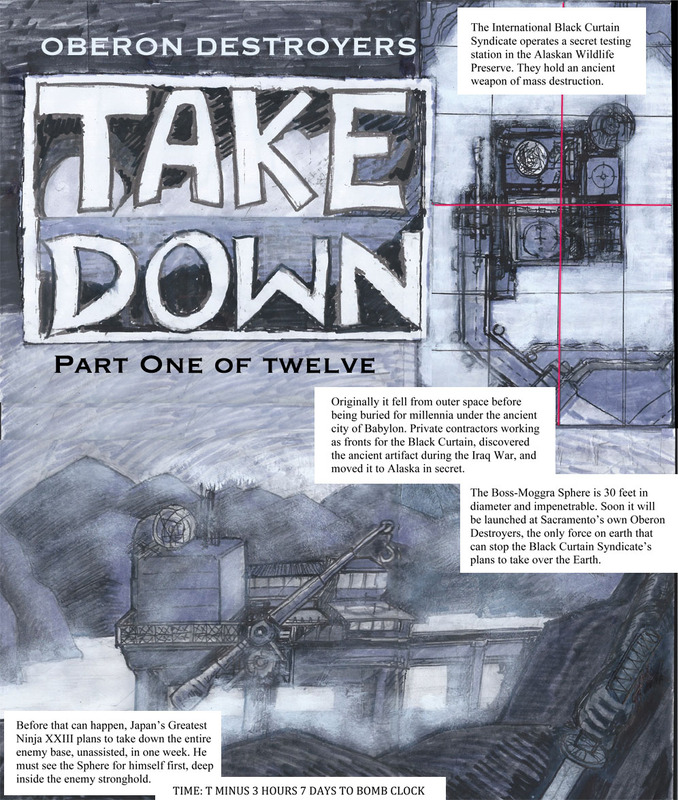 TAKEDOWN Part 5, the next installment – is now drawn and colored, waiting to be scanned. 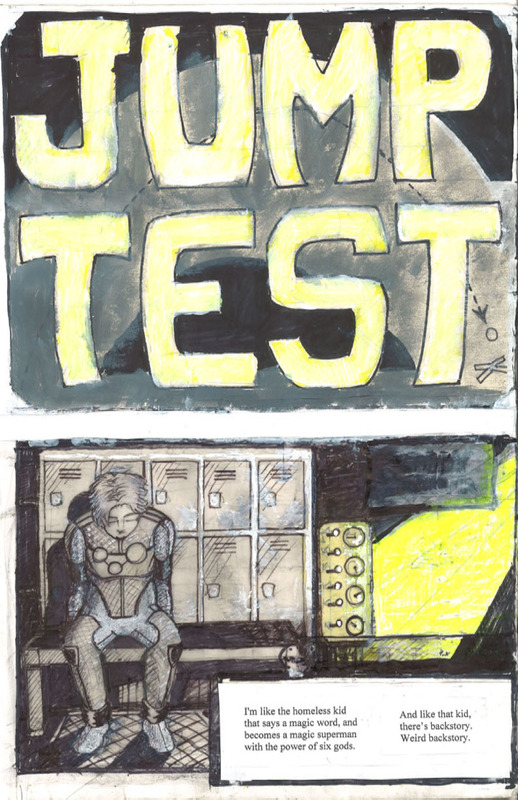 If I start scanning this weekend then look for this one by Monday or Tuesday. This chapter gets pretty bloody, all of a sudden. 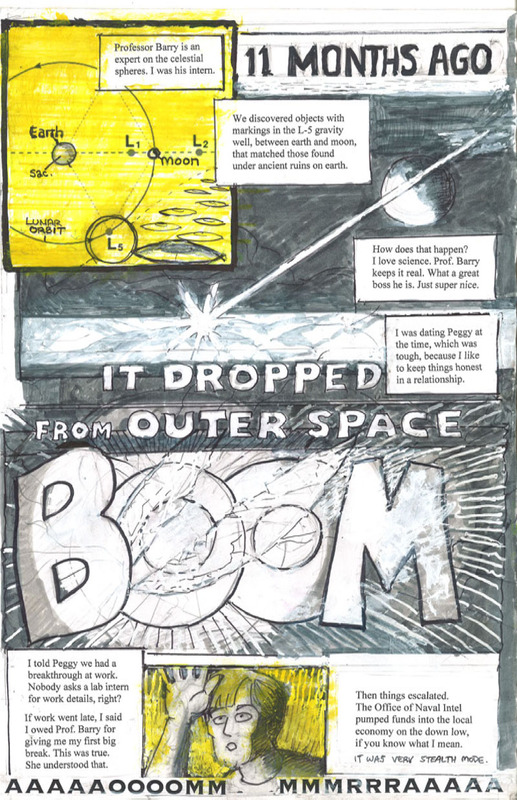 Here is the first page of the first installment, with a neat and tidy setup to the story. Previous chapters/installments of TAKEDOWN can be found here. 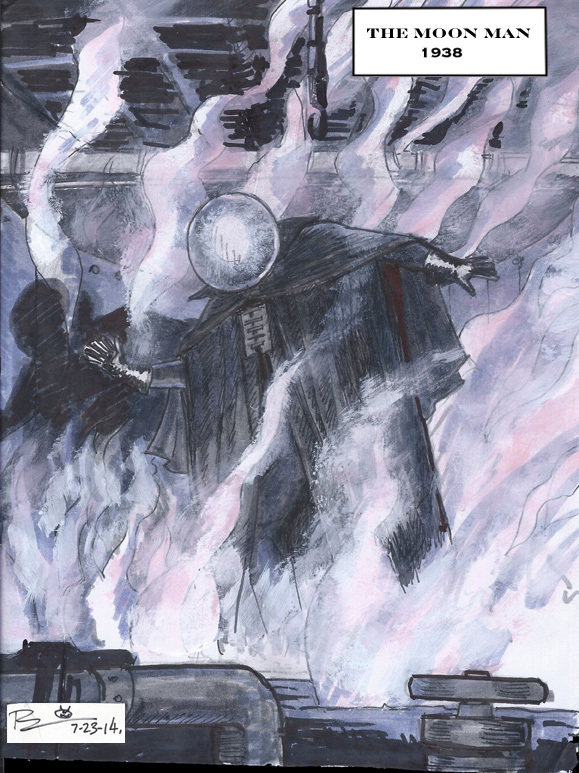 The Mask of Doctor Satan – Terror Train (short story/new pulp action) 14 pages. ClICK HERE FOR THE FREE PDF in our FREE SAMPLE SECTION. The Robot lumbers in a rambling house in Bookertown, New Jersey, a black township, founded on the ideals of Booker T. Washington. The original owner, Lionel Grimes, suffered a terrible tragedy at the hands of the current owner, the Doctor Satan Shell Company. The all white county police force stay away from Bookertown, and did not lift a finger to help poor Lionel and his family that night. It was horrible. The first floor of the large victorian was converted by its mysterious owners into an eatery called, “Amityville Restaurant.” The locals despise and shun the palce. The dining room feels like a dead quiet funeral for an unpopular man. Bookertown locals call it, “world’s worst chicken.” Most Bookertown residents avoid the house because the memory of what consumed the Grimes family still disturbs their minds. Some claim to have seen zombies in the windows, and most agree the one waiter on duty in the dining room, a blind man, is a zombie. His eyes are white, and he rarely speaks. You never knwo what’s happening with your order. And up above the unmistakable sound of thump, thump, thump. Iron clad feet walking slowly. 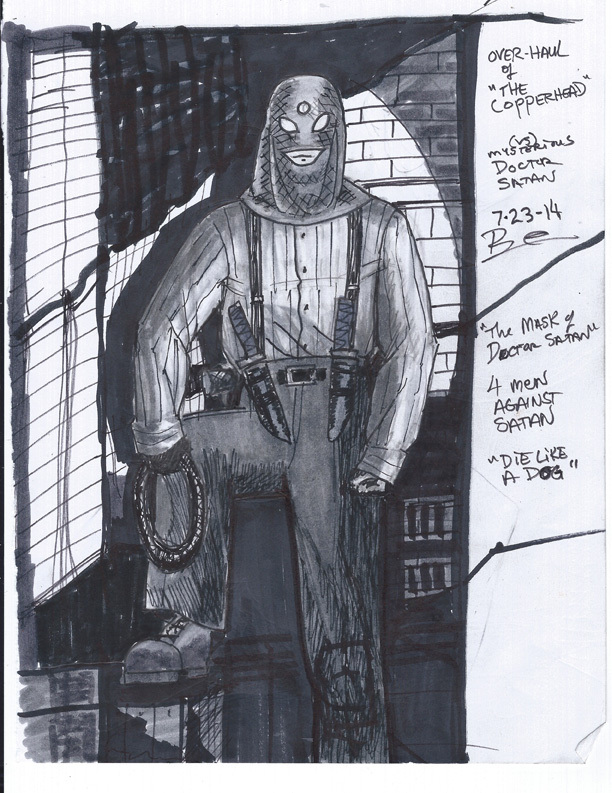 The robot runs with the zombies, haunting the house in Bookertown, one hour outside NYC. Wait, real zombies? With a robot? Is it a man in a suit? Exo Tin Can Suit? 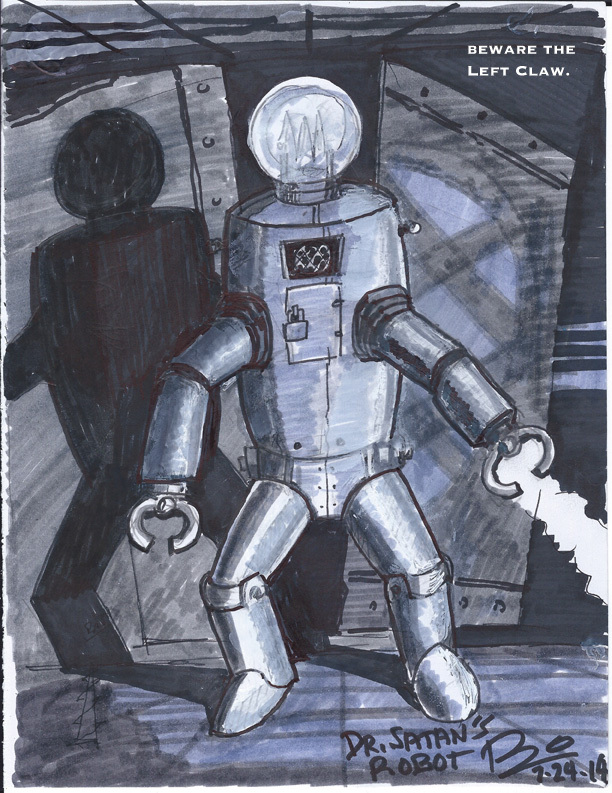 Is it a Borg like hive mind in a tin can ripped off from the Tin Man? Is this some scoobie do thing, rip off the mask of the ghost to reveal the gardener, “If it hadn’t been for your kids…!” Oh I don’t know. I mean I do know but, hey, where was I? A-Ha. Plotted out to 50 pages. I will be uploading all day today… about a dozen images. These are for a fifty page short story to be released in three parts over starting in a couple of weeks. Come back later for more details, or please see several posts in this archives! To be featured in issue 6 (next one), and 7, 8, 9 and 10. Action is in the wings. Rivet-head, The Green Mist, Red Succubus, the White Hood, and the Yellow Gas. Each has a unique history and character (see below), so please don’t judge a book by its cover. I am also working on several more two page webcomics focusing on a couple of particular characters, probably Joey, Kentaro, and Prince Crow’s Evil Twin. SEIGE of SACRAMENTO is where we are going now, see issue 5. Rolfie Huntsbrunner was a member of Ernst Rohm’s circle of immediate favorites during the Heyday of the SA. Young Rolfie (nineteen) adored Ernst, a much older man, who was at the peak of his power in the brand new, revolutionary regime. Rolfie was 19, tall, fit, loved sport, and very handsome. He was in love with the radical idea of the military as an agent of change. He rejoiced at the vision of men in uniform sharing the wealth of a corrupt ruling class with the poor, now that their friends in the Nazi Party were finally in power. The month of June (and swimming with the boys!) was gorgeous before the SS came to pound on the door. In June of 1934, Hitler broke the power of the SA in the “Night of the Long Knives.” SA leadership was arrested and executed along with other political rivals to Hitler as he consolidated his control over Germany. Ernst Rohm was given a gun and told to do the right thing. Legend has it he shook so bad he dropped the gun and begged the SS men to take pity and spare his life. They shot him anyway and told everyone his last words. Rolfie was arrested for treason, and first did a spell in prison for a year. In 1935 he was transferred out to a special camp for Paragraph 175 offenders (homosexual acts), based on evidence obtained from interrogations of other Rohm favorites and their jealous friends. He was there for one day and one night at a very crowded camp, before a man from Operation Stormcrow arrived asking questions. Stormcrow was a scientific unit asociated with Himmler’s SS. They took Rolfie in manacles to their lab and read legal papers. Rolfie’s record included car theft, drunken disorderly, gambling, narcotics possession, inciting a riot, failure to obey a police officer, resisting arrest, assault and battery, suspected of homicide, guilty of treason, and homosexual acts. Therefore, he would have no say in the matter. Five men held him down, they strapped him to a gurney, and went to work. Rolfie was a very early experiment, but he worked out for his controllers. 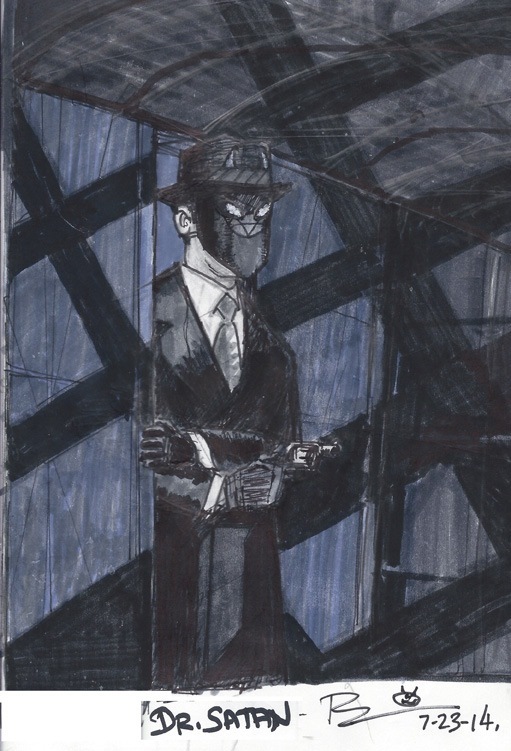 He was one of the most feared agents of a secret occult war occurring in the shadows of WWII. In the closing days of the war, the treatments on Rolfie (aka Rivet-Head) went better on his body than on his head. A shadowy international conspiracy offered to “buy the business” from the scientists after Germany’s imminent collapse, but only if the final package included Rivet-Head. Rolfie’s head was awake but his gross motor functions were deteriorating rapidly. Being clever men, they had a spare head from another convict ready to go at all times. They popped off Rolfie’s head and replaced it. After that, it just never seemed like the old Rolfie on missions anymore. 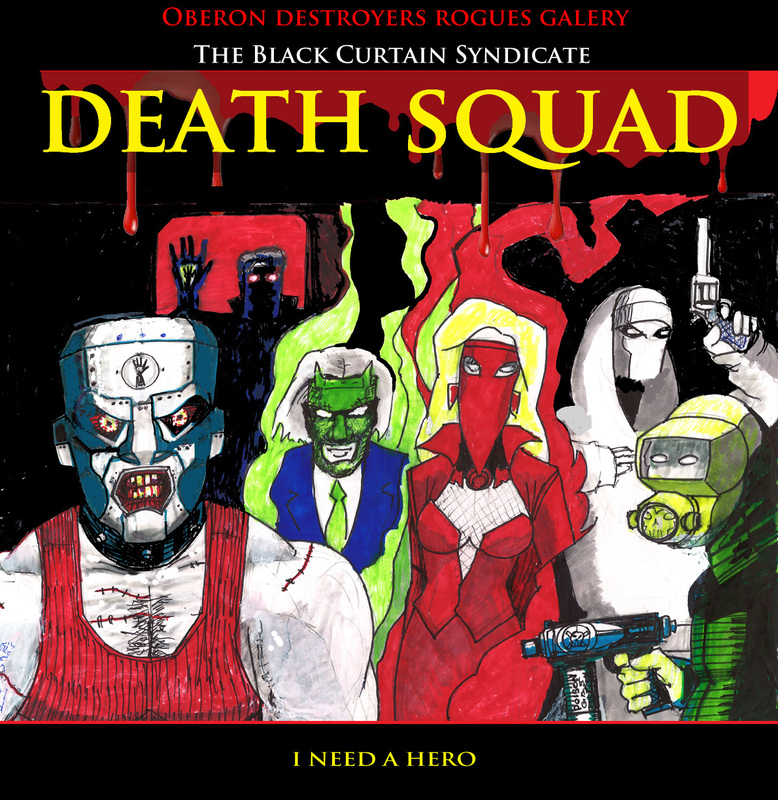 The Black Curtain collects heads, and is proud of the place Rolfie has within his collection. It took a great deal of time and effort to find after the war. He is still awake and has no motor functions, floating in a jar. But is Rolfie still gay? Rivet-Head Personal History © Brian McNally, all rights reserved.